As part of an awareness raising campaign, the Multiple Sclerosis Society (MSS) will be taking part in BBC Gardeners’ World Live (15th – 18th June, 2017, NEC Birmingham) with their first ever Show Garden. 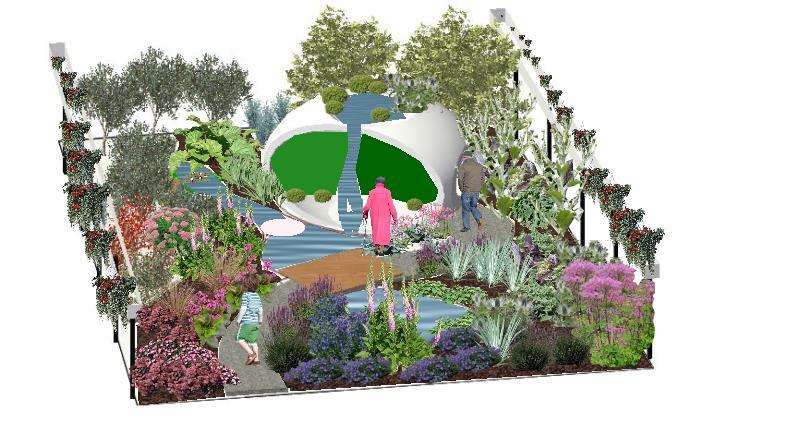 ‘The Journey to Hope‘ garden, designed by Mike Baldwin from Derby College, involves staff and students from the college, who are working together with the MS Society to illustrate the journey of those who suffer with MS, from diagnosis to living with the disease. The Show Garden is part of the 60th anniversary celebrations of the Derby and District Branch of the MS Society. It will convey a strong message about MS, a neurological condition faced by over 100,000 people in the UK alone, as well as serving to raise awareness of the work of the MS Society. The garden starts at a point in life before diagnosis where the planting is full of colour, from here visitors reach a bridge, representing the point of diagnosis and its devastating effects. The bridge itself is supported by the often-hidden caring hands of those who offer help and hope. From the bridge, the garden develops into an area representative of post-diagnosis, centred around a calming biophilia retreat – a safe area for reflection and mindfulness, where a support network can meet to heal and re-energise. A waterfall represents hope and quality of life.